after the mast break away incident last year we now await to hear what HAV’s plans will be going forward. Airlander returned to flight on the 10th of May 2017. She flew perfectly circling the are but no further than a 15 mile raidious of the airfield at Cardington. The ALS was deployed and looked quite cool on the ship, almost like a vampires fangs lol. As the flight came to an end they did a touch and go test landing then circled the airfield and came in to land for real. Gently sweeping in and coming to a stop. It was the end of a great flight and it seemed the whole of Bedfordshire came out to see her. 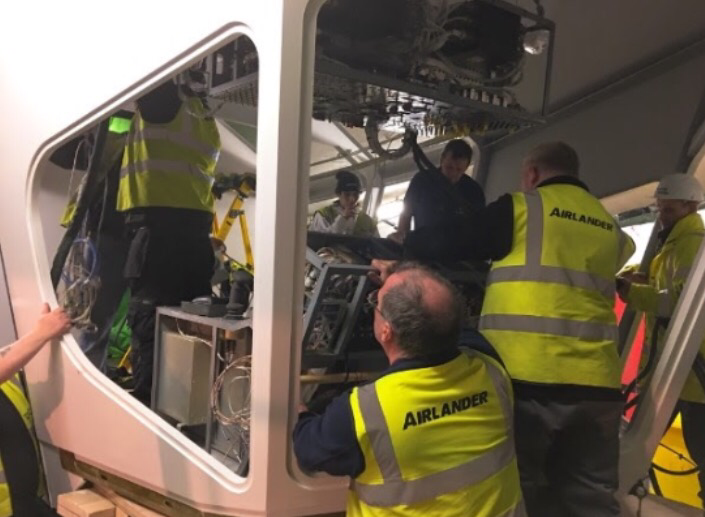 Airlander repairs approaching completion, image shows rewiring of the flight deck, should be back out soon. 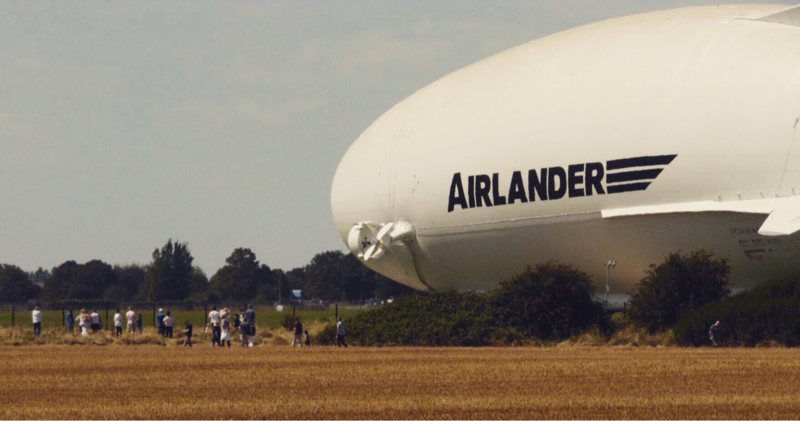 You may be all aware by now of the Airlander incident, no one was hurt but the front of the Airlanders gondola struck the ground and was slightly damaged. The he ship is now back in Shed 1 reviving a thourough check over and repairs to the damaged gondola. Believe the work with take a couple of months or so. it's been reported in certain news groups of a separate incident involving a mooring line and a power line strike, the power was tripped to a few local houses but there was no damage to the ship and had no part to play in the landing incident. HAV will thoughtfully investigate the incident and will report to the appropriate authorities. 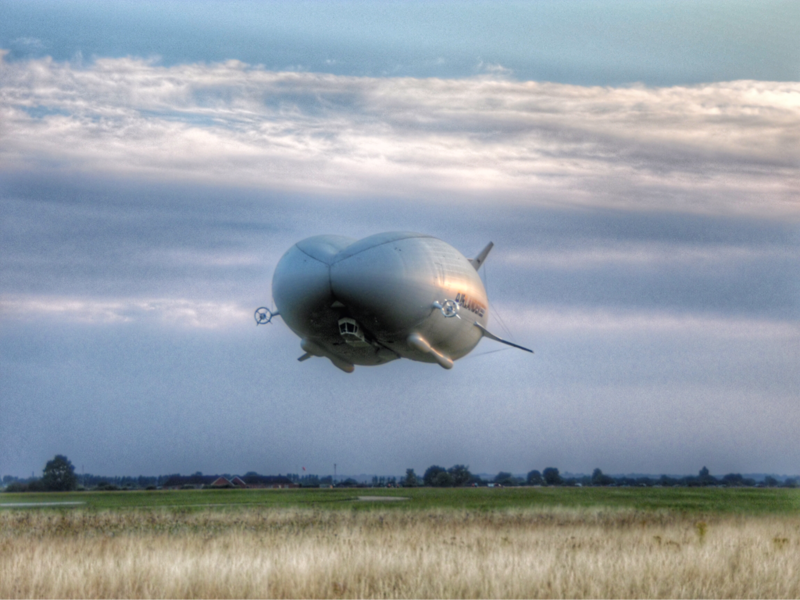 Airlander will be flying again in a few months time. 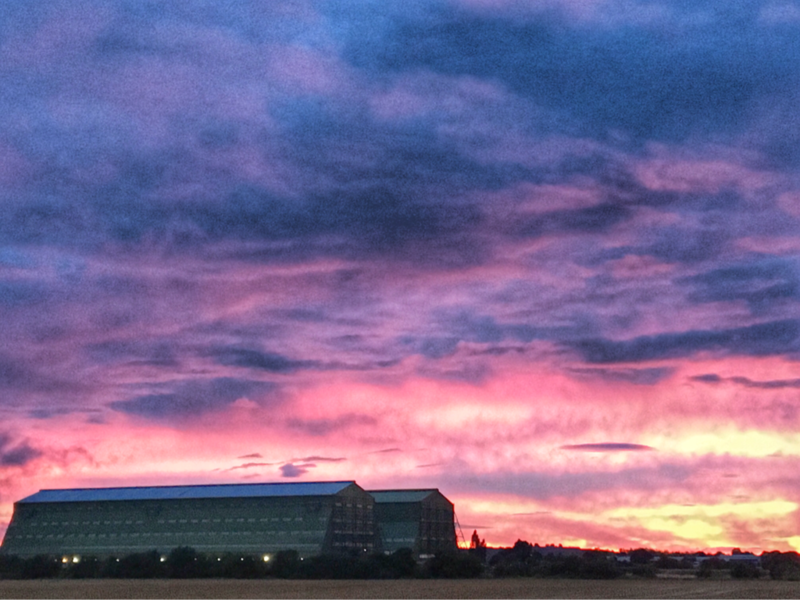 she took to the skies last night at Cardington. She flew like a dream. last min tech fault delays Airlanders maiden uk flight, updates as and when they filter trough to the next attempt. 4am on the 6th of August 2016 HAVs Airlander was rolled out from Shed 1 taken across the Cardington Airfield and moored to her mooring mast. A short while of ground testing will now commence before first flight. Home to the Cardington sheds / Hangars. This site is ran by fans for the fans of the Cardington Sheds, it has absolutely no connection with the owners of either Shed. 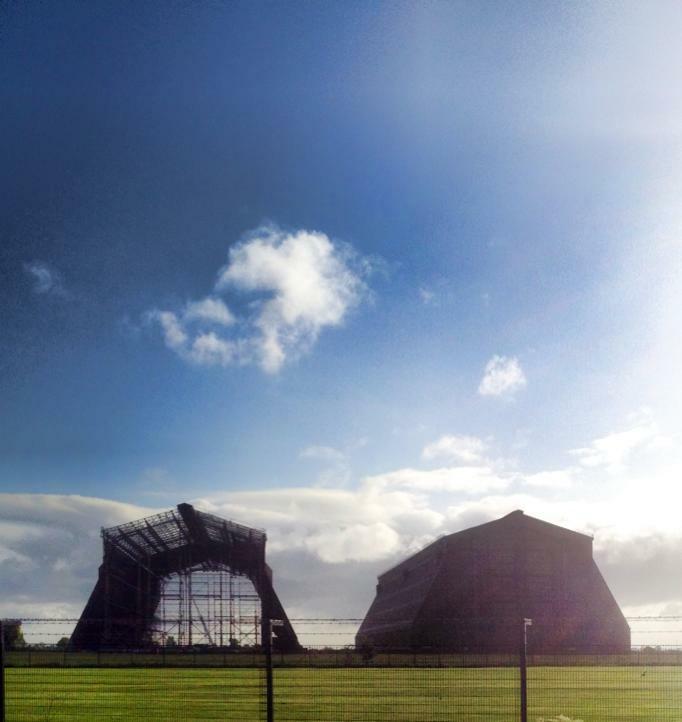 We just love the Cardington Sheds! 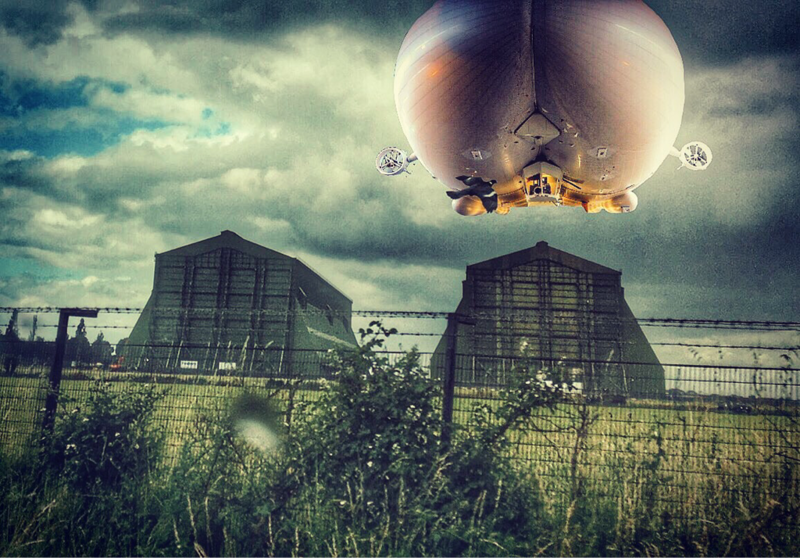 all 4 engines run on Airlander, fuelling tanker spotted at sheds last week. She is fuelled and very close now to being brought out. Shed 2 tower block news, All but one of the tower blocks built in Shed 2 for fire testing when the shed was owned by the fire research establishment have been demolished, this will free up the remaining half of the vast Shed 2 for more movie work and rehearsal space for bands, will keep you updated. Shed 1 restoration continues, relaying of concrete on the floor of the front half of Shed 1 has begun, on completion of the re laying they will recommence the re cladding of the last part of the sides. will keep you updated. official website will be coming shortly. The British Airship Museum at Cardington. COMING SOON. CLUB AIRLANDER LAUNCHES, JOIN TODAY. Access to the hangar, when it is opened up to the Public (with great views of the Aircraft being redeveloped). just click on the above link. After a recent visit to HAV at Cardington i can now breath a little easier with ref to the housing development, HAV have stated the the proposed housing development should not interfere with their operations on the airfield, this is fantastic news and reassuring to here an airship company producing LTA aircraft back at the home of British airships, Cardington. 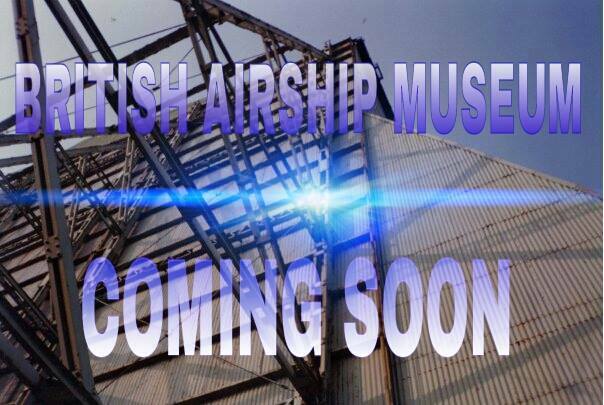 As the year goes on any news and pictures on the development of the HAV304 will be posted here, they may be posted a little earlier on the "we love the cardington sheds" page on facebook so please like the page and keep up to date, info on the page can be found under the airship pages on facebook page above. Also the restoration of shed 1's sides will continue with the ship in the shed, they will reskin the rear and then when that is complete move the ship to the rear of the shed and do the front. They year started badly but its getting better all the while, 2014 is when the Giants came home. 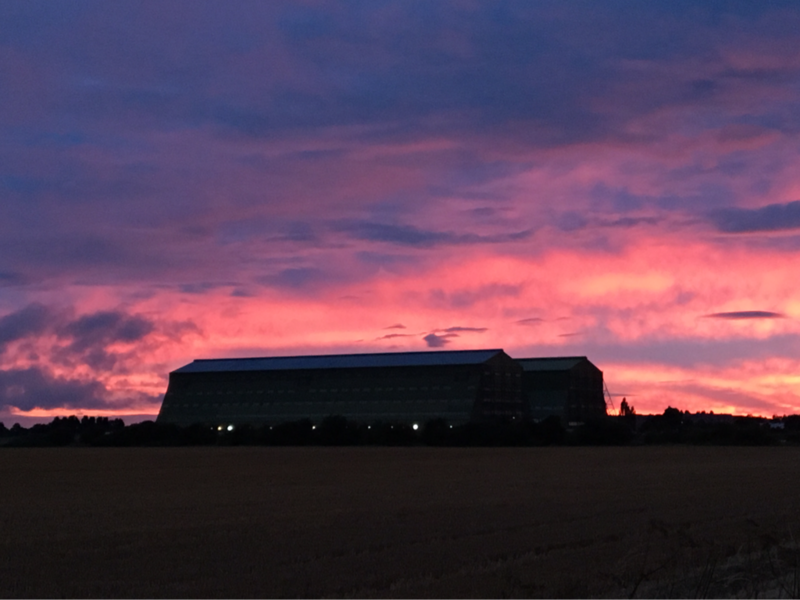 LONG LIVE THE CARDINGTON SHEDS (HANGARS)! HAV304 LARGEST CURRENT BRITISH AIRCRAFT IN THE WORLD GETTING ASSEMBLED IN SHED 1 THIS YEAR. TO FLY BY YEARS END. AIR INFLATION BY LATE JANUARY 2014 AND ASSEMBLY THROUGHOUT YEAR, POSSIBLE TEST FLIGHTS LATE 2014. CARDINGTON WILL BE USED FOR ASSEMBLY OF HAV304. THIS FROM THEIR TWITTER FEED. 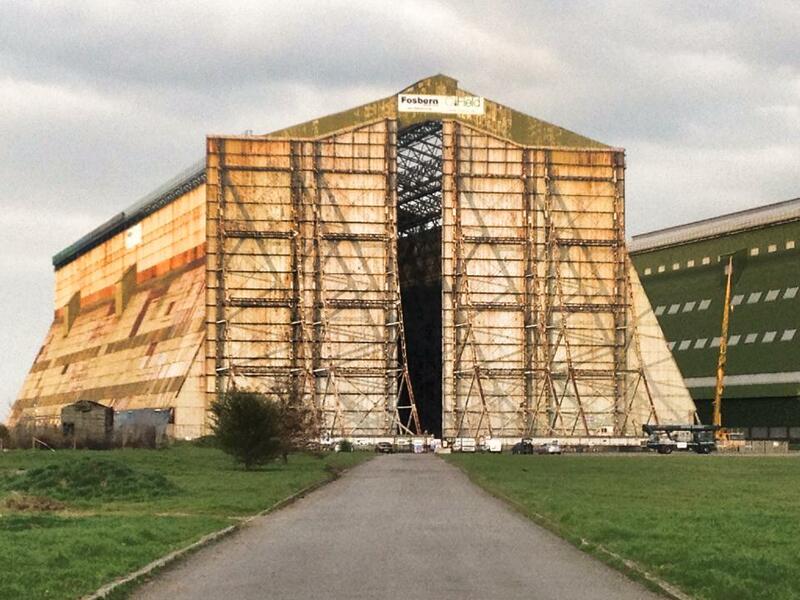 HAV can confirm it is moving into the Cardington Hangars, Bedfordshire. Sorry no visits yet as it will be a working site! HAV304 (LEMV) is heading to the UK, this in from HAV's official Facebook page. The Long Endurance Hybrid Air Vehicle (the HAV 304) is now just leaving the USA packed up in around a dozen ISO containers, and will arrive in Liverpool in a week's time. A week after that it should be in Bedfordshire. We'll let everyone know in due course where it will be, and of course there will be plenty of milestones next year when it gets air inflated, shown off to the public for the first time, helium inflated, re-put together and then first UK flight later in 2014...then on its way to type certification. Watch this space! 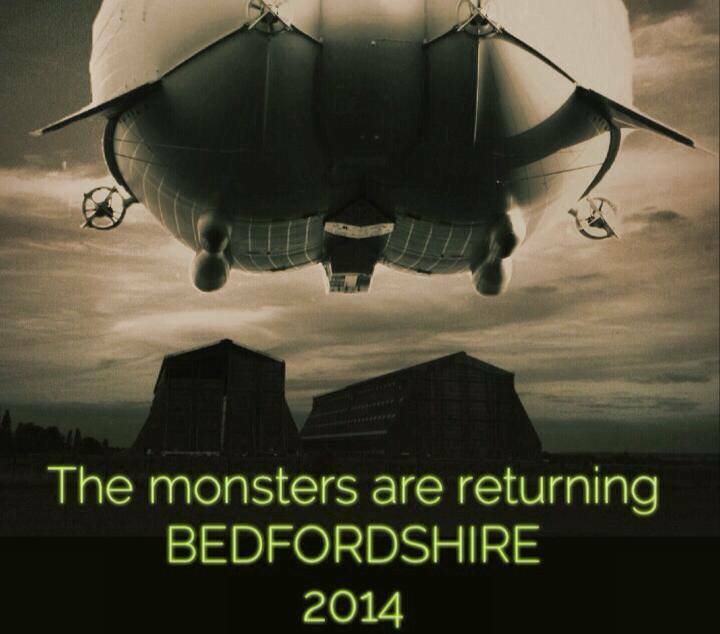 So does Bedfordshire mean the Cardington Sheds (hangars) ???? The HAV304 will be the largest British designed aircraft to be flying today. HAV return to the Cardington Airship Sheds / Hangars for construction of HAV304. LEMV. 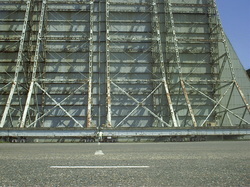 Proof that Cardington was used in the filming of the first Star Wars film. 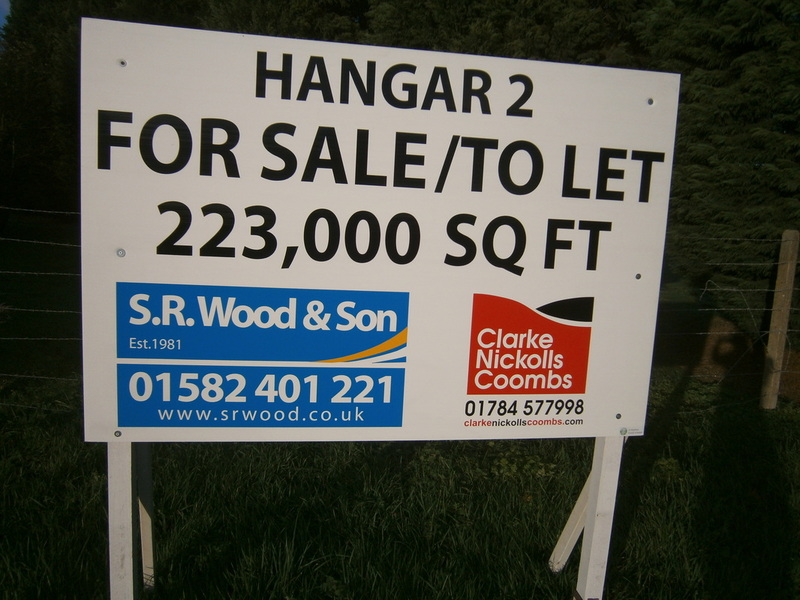 Sign at Jackson gate, Shed 2 at Cardington is up for sale. 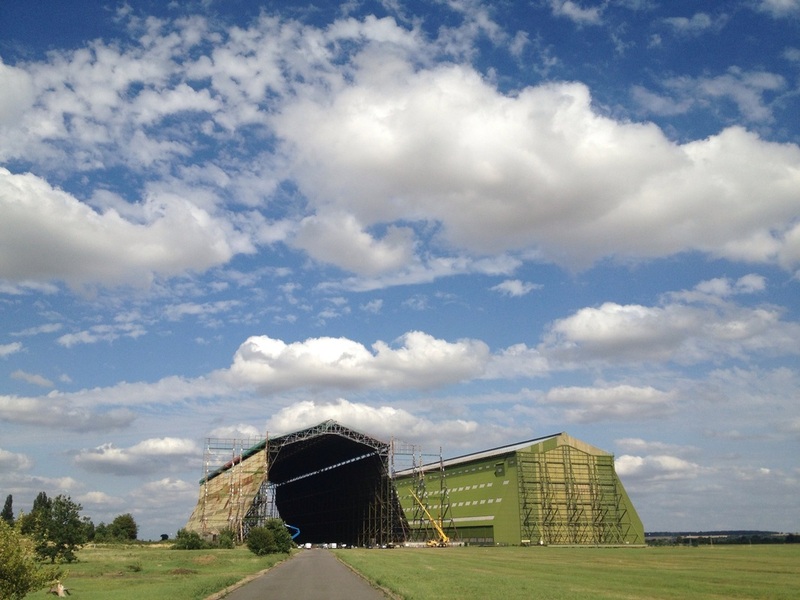 Originally built at Pulham St Mary in Norfolk, Shed 2 was brought to Cardington for the imperial Airship Scheme to house HMA R100, and also used to house Barrage Balloons and crews would have trained there during WW2. In recent years Shed 2 was used to test full scale building fires by the BRE, multi story wooden and steel framed buildings were assembled inside the shed for the tests, in the last 10 years it was used to film parts of the Christopher Nolan Batman trilogy and parts of Inception, Both Sheds appear at the beginning of Batman The Dark Knight Rises. The skyship 600 flies again, Designed and first flown at Cardington this classic airship design is reborn and currently on a Mission for the BBC' s new program, Cloud Lab. the airship has been named in Honor of George Spyrou who was head of Airship Management Services, the precursor of Skyship Services Ltd who sadly passed away in 2010. So stay tuned and at Last a 600 is flying again, you cant keep a good ship down. Latest news, views and images will be posted to this site as and when they happen. remember to Like the facebook page to have daily updates, images and news as they happen, together we are telling the story of the restoration of this major Bedfordshire Landmark. Cardington Hangar / Shed 1, Doors open again, striped of cladding, both doors open together for the first time since the mid 0's. 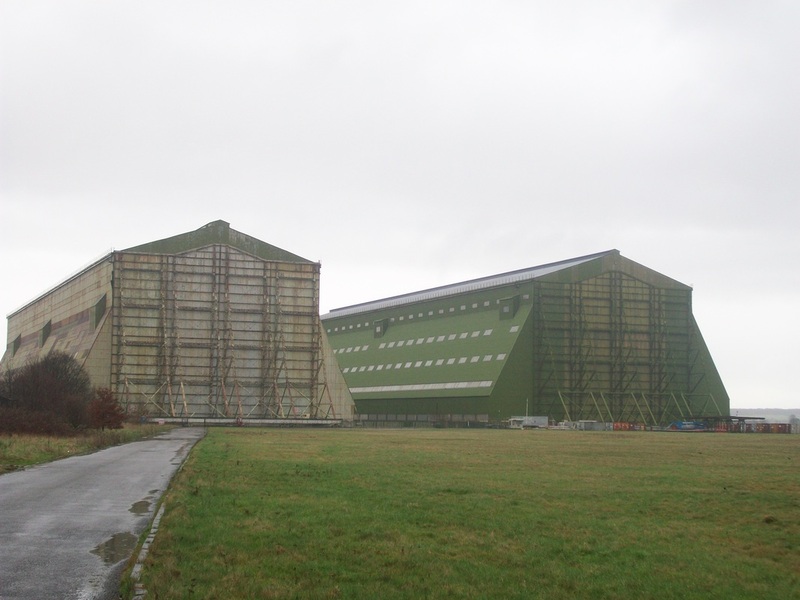 Cardington Shed - Hangar 1, doors and rear wall completely striped. 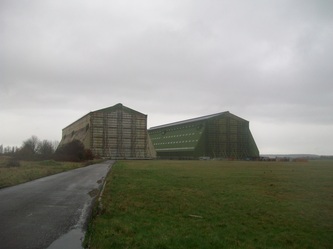 Cardington Shed 1, Old Roof removed. 26/04/2013. the sheds from Jackson Gate, total old roof material is now removed. Cardington shed / hangar 1 old roof totally removed. A closer shot of the Doors of shed / hangar one at Cardington, the door is half open and the stripped roof can be seen from the inside. this image was taken on the 25th of April. 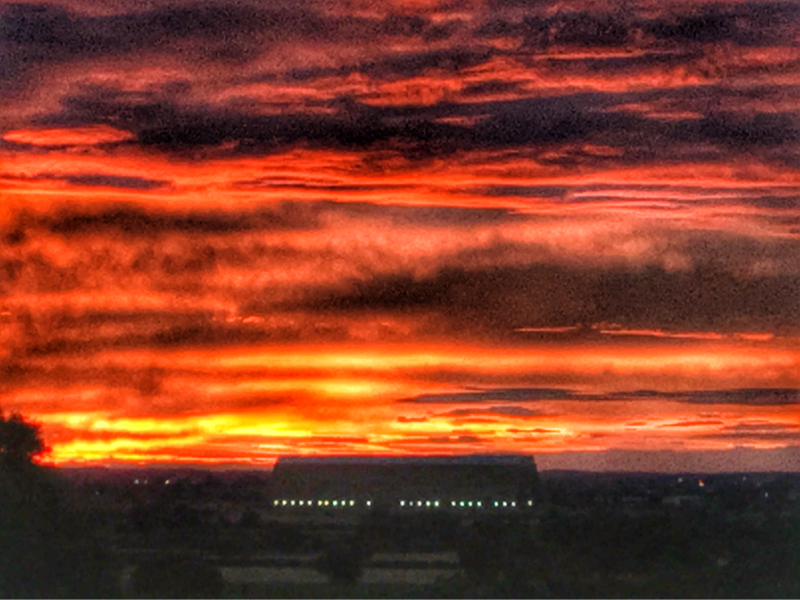 Cardington, the home of British airships. Welcome, this site will hopefully enlighten and inform you of the great and colourful history of Cardington airship station/ RAF Cardington,Home of the Ill fated R101, which remains to this day the largest British aircraft that has ever been constructed, at 777ft long it is a record that has never been broken. also Cardington is were the barrage balloon crews were trained in world war 2.have worked on a few photo montages using images of Cardington and a few of it airships, there all on the images page and i hope you enjoy them, most of the pictures on this site have been taken by my man on the front line, my Farming father Howard Monk, a lot of the of the Photos on here can be accredited to him, i would take more personally but i am at work mostly when all the good stuff is happening so my dad is more than happy to get snappy for me, seeing he has used quite a basic Camera he does seem to take a good picture. and he knows usually where to go to get them, shh its a secrete. 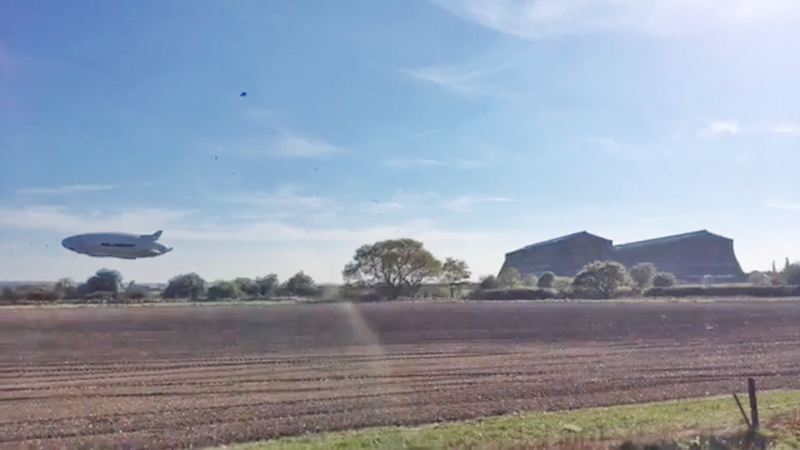 "New Cardington" has had its first phase opened, with all these new houses and a new generation and new chapter of this historical site opens lets keep the memory alive of the pioneers that started the whole thing off. on the video page there are a few clips of an RC airship model of the r101, built by Nigel Well's , it was a fantastic flying model that is sadly no longer with us but enjoy the few clips on the site of her flying. my family has farmed in Cardington for many years, i grew up in Cardington and remember asking my granddad all about the R101 every time i saw him when i was a kid, My Great aunty worked on the R101 and was one of the crew that helped walk the ship out many times, the ships that flew at Cardington when i was a child were a little smaller, Roger Munks skyships, i saw the first flight of the skyship 500 GBIHN, this was the ship that featured in the 007 James Bond movie a view to a kill. you may hear as you trawl the net the phrase Cardington airship hangars, this is a bit of a funny point when it comes to airship historians, when cardington's shed 1 first appeared it was called an airship shed, then with the RAW and shed 2 arrived they where still called sheds, when the RAF took over they were then known officially as hangars, the term sheds is correct for airships, although Hangars is used an awful lot when describing them on-line and on news reports, so you can use both terms but i am in the sheds camp so i will call them the cardington sheds, but its not a crime to call them hangars either. From its wartime beginnings as part of the Shorts brothers with its first two wooden framed airships, the R31 and R32 on through the years to the R38 and onward covering the R101 onward to the 80's and Roger Munks fantastic skyships, into the 0's and Roger Munk again with ATG and into the future with Hybrid Air Vehicles and their fantastic skycat hybrid airship. the village of Shortstown grew from the need to house the workforce on the base, shortstown has continued to grow from there on, it is now quite a large village in its own right and soon to be enlarged with the new development on the old RAW workshops site, however the new section is called New Cardington, however i think its clearer to call the site now in total shortstown. if your looking for the poll its at the bottom of this page. Don't forget to keep checking out my airships poem page, they are all my own work, i hope you like them and i am always open to constructive criticism. Did you know how important Cardington became during WW2? barrage balloon's were developed at RAF Cardington and used with great success through the war. as well as inflatable tanks and armament to fool the enemy. Keep coming back, any news be it from the net or from local sources will be posted here, in association with the many facebook groups i run. also i have started to write poetry on airship themes, i hope you like them, also the pictures which are mainly from my own collection of personal snaps are present. The R101 airship disaster will always be mentioned when it comes to Cardington, the R101 airship was the largest British aircraft that has ever been constructed, this is a fact that Bedford should be proud of, the ship had her problems, she was very robustly built and there was great craftsmanship went into her construction, a selection of technical problems and rushed choices went on to seal her fate in a terrifying way, our thoughts on those brave men 80 odd years ago should never be forgotten, nor should the R101. Did you know that the wreckage of the R101 was part salvaged by Zeppelin and some of that scrap might have been recycled and used in the Hindenburg? below bit from the Airship heritage trust. It was noted in the records of the Zeppelin company that they purchased 5,000kgs of duraluminium from the wreckage for their own use. Whether this was for testing and analysis or to re-cast and use in the "Hindenburg", is open to further research and speculation. The Cardington airship sheds are fantastic, historic and absolutely gigantic, shed 1 (R101's shed) is in a terrible state at present, it is still awaiting its restoration, housing being developed at the rear of the sheds has not started construction as of yet either, it is of vital importance that shed 1 is restored and soon, its state at present is absolutely appalling. keep coming back for all the latest news on this important historical Bedfordshire landmark. as soon as more news becomes available be assured i will post all the info i can get on here. 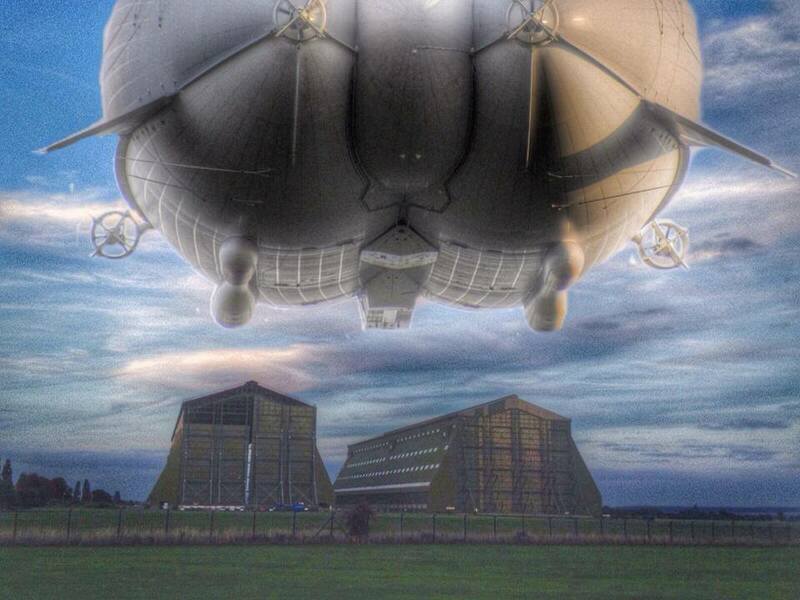 TOGETHER WE CAN SAVE CARDINGTON FOR FUTURE BRITISH AIRSHIP DEVELOPMENT. NEW AIRSHIPS POEMS SITE LAUNCHED. Due to the airship poetry page getting too big now i have decided they need their own website. Stop Press, new RAF Cardington website launched, great info on the RAF Cardington days. 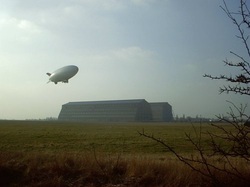 the Cardington airship sheds, Bedfordshire. with Goodyear blimp spirit of safety moored out front. Trevs Airship File Slideshow: Trevor’s trip to Cardington (near Elstow), Bedfordshire, United Kingdom was created by TripAdvisor. See another Cardington slideshow. Create your own stunning slideshow with our free photo slideshow maker. TWO SHORT VIDEO'S I TOOK OF THE FILMING AND PROPS FOR NExT YEARS CHRIS NOLAN FILM BATMAN THE DARK KNIGHT RISES ON THE AIRFIELD AT CARDINGTON OVER THE LAST WEEK, THE FIRE RISES ON ONE CLIP WERE FILMING WAS TAKING PLACE, TOM HARDY WHO PLAYS BANE IN THE FILM WAS SAID TO BE THERE, WHILE THE OTHER SHOWS THE SHEDS AT CARDINGTON AND THE PLANE PROP ON A BIG GIMBAL, THE QUALITY IS NOT GOOD BUT IT GIVES YOU AN IDEA OF WHATS GOING ON, CHEERS AND ENJOY soz about my voice over lol. The boys are back, rehearsing for a tour in shed 1. a video of the boys in the shed on the below link. some cardington themed products for you to look at or buy. link above. the airship question poll is at the bottom of the page. click here to see footage of my Goodyear blimp spirit of safety flight, also my interview by documentally on the day here. my new R101 video, set to the Hymn Abide with me, recorded at Cardington church on the 3rd of october 2010. My poem, The Ship, read by me with images, hope you like it. The blimp AT-10 AT Cardington, a fantastic little airship. now you can follow us on facebook with our new group. on there you can post responses to anything you see on the site, including out new airship Poll, remember if you have not voted yet you can the current poll question can be found at the bottom of this page. 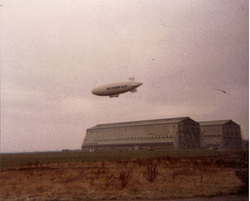 the above picture is of a skyship 600 airship flying above the Cardington sheds. 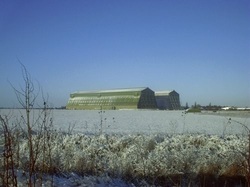 Cardington sheds in the snow.